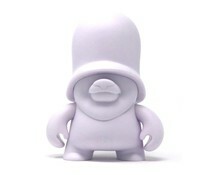 DIY Spray Can Vinyl Toy eliminates all issues and risks with customizing actual metal spray cans. No mess, no smell, no rust, and no sharp metal edges. A truly safe and even kid friendly alternative! Introducing the DIY Spray Can Vinyl Toy! It's a full scale replica of a standard spray can from Discordia Merchandising. Made of Rotocast Vinyl, it is completely hollow, and lightweight. Perfect for handling, painting, sculpting and carving upon. The 7.5" Spray Can DIY (White) by Discordia is an open edition.